You can serve this easy recipe with any side dishes you want to. Any pasta salad, a green salad, or a fruit salad would be delicious. Add some grilled bread and a glass of two of iced tea for a delicious dinner. Combine the soy sauce, brown sugar, mustard, water, salt, and pepper in a shallow bowl and mix well. Add the pork chops and turn to coat with the marinade. 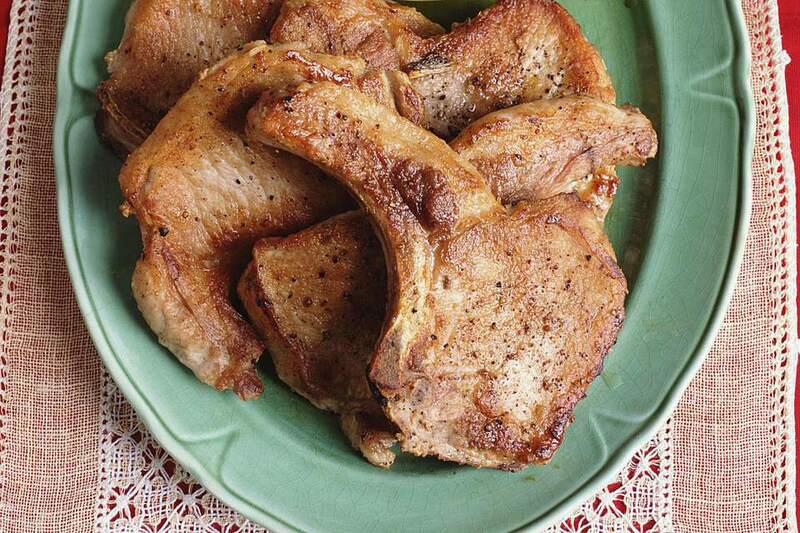 Cover the pork chops and refrigerate for 30 minutes up to 8 hours. When you're ready to cook, prepare and preheat the grill, building a ​two-level fire. Remove the chops from the marinade; discard the marinade. Place the chops on the hottest part of the grill and cook for 1 to 2 minutes. When the chops release easily from the grill without pulling or tugging, turn them and sear them on the second side, for 1 to 2 minutes. Then move the chops to the cooler part of the grill. Cover and grill for 4 minutes. Turn the chops and cover; grill for 4 to 6 minutes longer or until a meat thermometer registers 145 F to 150 F.
Remove the chops from grill, place on serving plate, and cover. Let stand 5 to 10 minutes, then serve.